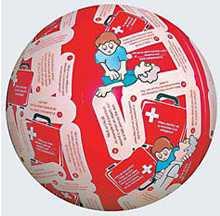 The medibag first aid kit is the kid friendly approach to first aid. 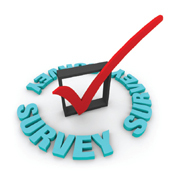 Doctor recommended and highly awarded in the juvenile industry. 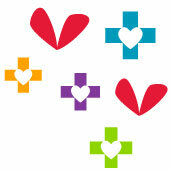 The medibag is exclusively manufactured in the USA, mom invented, and each purchase gives back to people in need! The unique Dr's bag design and the carefully chosen contents, make this product. "not your ordinary box of bandages." The medibag is great for home, sports, auto, travel and more. 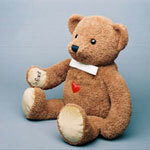 It makes an amazing, thoughtful gift for any occasion and the personalization on the front allows the children to put their name on it, and "call it their own." (1) Reusable & recycled Carry Anywhere Case. purchase 96 units (12 cases) at only $4.45 each! Imagine you are at your favorite restaurant that serves your favorite food exactly like you want it! The possibilities are infinite with the amount of food that you can serve, how much you can charge for your services, what type of food you want to serve, and who will be at your restaurant. 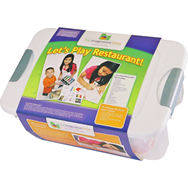 The Let’s Play Restaurant Dramatic Play Box provides all the tools your child will need to get started! From there, let their imagination take over! The durable, stackable, oversized (18"x12"x7") container makes clean up and organization a breeze!!! After opening the Let’s Play Restaurant! 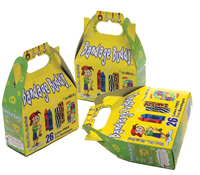 Dramatic Play Box, an unlimited amount of play and creativity will follow. Children will love creating their own fine dining establishment that has beautiful views of Central Park in New York or they might want to sell hotdogs to the construction workers who work down the street. The ideas are endless! 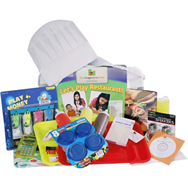 It Comes with a Parent's Resource CD-ROM and an Education Guide for parents to enhance play and learning!! Bulk Discount, purchase 3 at only $34.50 each! Most kids love animals and playing doctor, so why not combine the two! The Let’s Play Veterinarian! 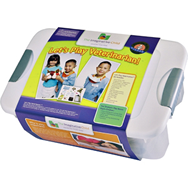 Dramatic Play Box™ encourages kids to become a veterinarian for a day. With animals included, watch as your child transforms into a caring vet, listening to animals’ heartbeats and bandaging their scrapes and cuts. 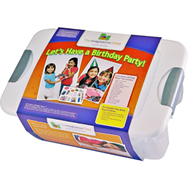 The durable, stackable, oversized (18"x12"x7") container makes clean up and organization a breeze!!! The scrubs and surgical mask can be worn by an adult or child, so grown ups can join in the fun! Our specially designed prescription pad allows your child to think about a diagnosis and test out their writing skills to write up a prescription! Everyone needs to take a vacation from time to time. With our Let’s Go On Vacation! 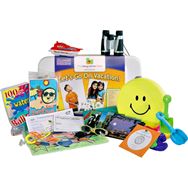 Dramatic Play Box™, your child can visit any place in the world using their imagination. Travel tickets are included, so hop on a plane, train or boat and have fun! 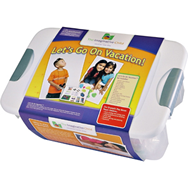 The durable, stackable, oversized (18"x12"x7") container makes clean up and organization a breeze!!! In addition to choosing a destination, your child will also learn how to plan a vacation, deciding upon all the details of their magical trip. 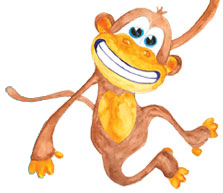 Postcards are included, so kids can use their early literacy skills to send you a note from their fun vacation spot! Watch as your child puts on the sunglasses and binoculars and heads off to a world of creativity. Celebrating someone’s birthday is a very special occasion that requires a lot of planning, preparation, and oh yes, IMAGINATION! Creating a birthday party for a loved one or a friend can be a lot of fun. You can invite guests to come to your birthday party or a friend’s party if you are doing the planning. The durable, stackable, oversized (18"x12"x7") container makes clean up and organization a breeze!!! 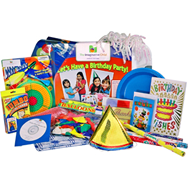 The Let’s Have a Birthday Party Dramatic Play Box™ provides all the necessary pieces to imagine a great birthday party! 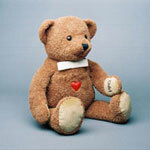 Your child can plan a party for a friend or family member or pretend it is their favorite stuffed animal’s birthday. Watch them try out their writing skills as they address invitations and write a birthday card for the lucky birthday person! *All products are latex free! This colorful, inflatable 24" vinyl ball (no latex!) 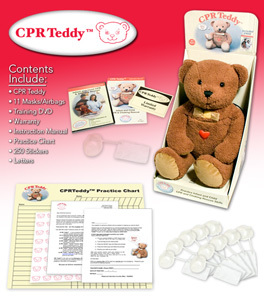 provides a fun way for students to practice their CPR and first aid skills. Students will answer the question found under their left thumb after catching the ball. 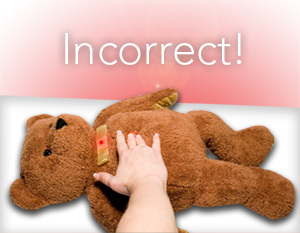 Questions include: True or False: If a person has a burn with blisters, you should break the blisters. Do people die most often from car accidents or fires? Where should you check for a pulse on an adult? A sheet with instructions and answers is included. Grades 4-8. Bulk Discount, purchase 8 at only $14.50 each! 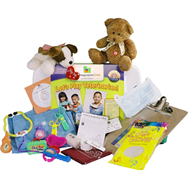 This essential kit contains critical information cards for you, babysitters, doctors, grandparents, and any other caregivers for your children. Extremely helpful in case of emergency. 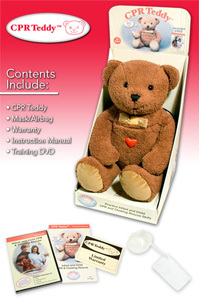 Fingerprint, personal information, physical attributes and emergency contact cards are included. 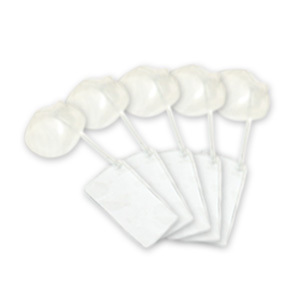 Bulk Discount, purchase 25 at only $3.01 each! 29 Piece Mini OwWee First Aid Kit - 1 each Ideal for a backpack or bike bag, our OwWee first aid kit was developed with kids' minor emergencies in mind.